Damian Lazarus presents his new artist project. 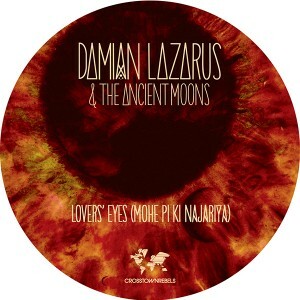 Damian Lazarus and the Ancient Moons will make their debut on Crosstown Rebels this summer. The single 'Lovers' Eyes (Mohe Pi Ki Najariya)' is the first release from Lazarus's new collaborative artist project, which will build towards an album and live shows in early 2015. Lazarus has been joined at the production controls by James Ford (Simian Mobile Disco, Arctic Monkeys, Florence), with album recording sessions completed in Mexico in February. Ancient Moons brings together a wide assortment of vocalists, collaborators and players, from around the world, with more details of this heady mix to be released in the near future. Taking inspiration from Lazarus's Lazpod series, Get Lost events and Day Zero festival in Mexico, this is music for deserts, jungles and sunrises. Getting the ball rolling is this 12”, ‘Lovers' Eyes (Mohe Pi Ki Najariya)’, a single that promises to be one of the year's more unique and distinctive electronic music releases. Vocalists Fareed Ayaz, Abu Muhammad and Hamza Akram are Pakistan's leading Qawwali singers. Qawwali takes the form of a series of thematically and formally linked verses, and is steeped in a tradition that can be traced back to the 13th Century. On ‘Lovers' Eyes (Mohe Pi Ki Najariya)' they sing of cosmic love, and the four eyes of the lovers becoming one. Set to Lazarus and Ford's incendiary techno production, the result has been causing chaos on the dancefloor. Early tastemaker reactions has seen everyone from Skrillex to the BBC Asian Network, Totally Enormous Extinct Dinosaurs to Carl Craig chiming their approval, and with Pete Tong awarding ‘Lovers' Eyes' Essential New Tune on Radio 1, this has all the hallmarks of being one of those wonderful electronic music curveballs that confuses and delights in equal measure. The Ancient Moons have entered our orbit.